No not a real policeman. 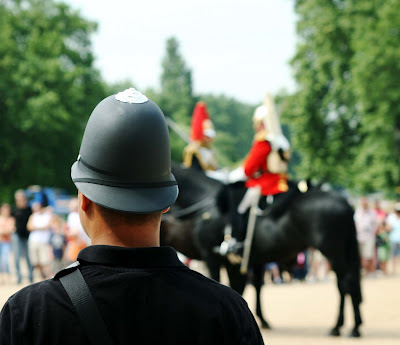 A tourist with a plastic police helmet watching the changing of the horse guards. I love these touristy things - policemens helmets and pomp! I love the changing of the guards ceremony! I think changing of the guards, while touristy, would still be amazing to see! So cute! I really thought that man was the guard!